Why are our kids so damn fat? Yesterday a news story came to my attention about a woman who lost her child to child services due to the kid’s obesity. The third grader was given over to foster care because the mother was deemed unfit. Apparently the kid weighed over 200 pounds, 200 POUNDS! and is only 8! I don’t even know how one has time to get that big in that small amount of time. Well anyway, the mother claims that she does care about the welfare of her son, but was still going against the doctor’s orders. This story is so strange to me because I cannot believe how large we have been getting as a country. When I drive by my old high school, I typically will see a group of teenagers, one may be of normal weight, with about four others that are far beyond the overweight category. It’s considered very normal, especially in my small town. I will admit that this is a town that my no means is going to be competing in any beauty competitions, but it is still shocking. When I was a teenager, I was fat. Looking at the girls today, it seems, I wasn’t comparably fat. At my largest I was just under 5’9 and topping out at 195. I felt like a total heffalump. I’m only 26, so this wasn’t all that long ago. Luckily, today I fall between the 135-140 range, which I am completely relieved about. But why has it gotten okay to be so heavy? I am all for loving your body, and accepting who you are, but there are some people who use that as a crutch in order not to take the time to get healthy. Some people are built to be larger than others, but some are simply relying too much on laziness and a poorly chosen diet. 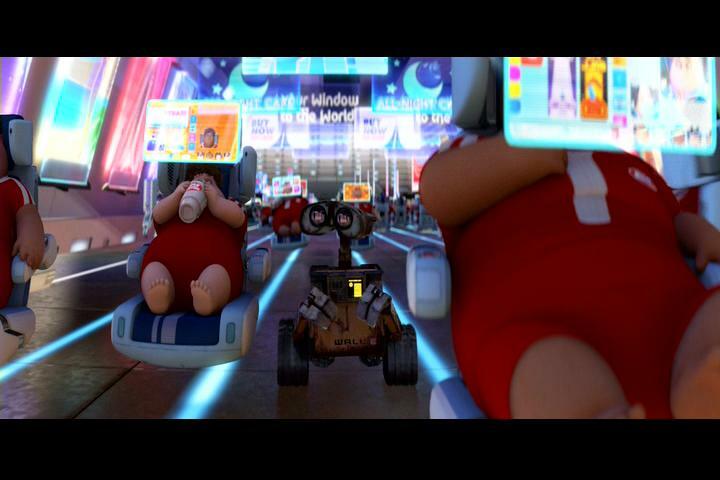 I’m seriously thinking that the fate of the world might truly end up like the movie “Wall-E”, that element of the movie, while amusing, seems terrifyingly true. So I do concern myself with my children’s future. Luckily, I provide very healthy diets, I only occasionally supply the items of the corn dog and pop tart variety. My son, he is the finicky one, he just doesn’t really like to eat. He likes fruits and vegetables a lot, hell, the kid bites into tomatoes like they’re apples. Even when he was an infant, he didn’t want too much to eat. My daughter, at only 10 months old, is competing for world eating competitions. The kid loves to eat, and she will eat your damn hand if you are holding something tasty. She is chubby girl, still significantly smaller than I was at that age, but that’s why they called me Miss Piggy. Hopefully, her insatiable appetite will calm down, but luckily her constant physical activity makes up for it. Like with so many things, I have learned from my mother’s mistakes when it comes to feeding children. My mother raised us on junk food. When I was a depressed teenager who just sat in her room watching movies all day, my mother would bring home Hungry Man dinners and Chocodiles, reading that sentence makes me feel queasy. It wasn’t my mother’s fault, she is an enabler, but a loving one. But that is what is wrong with many parents today, that is what is wrong with this woman from Cleveland who allowed her 8 year old to become Dom Deluise. We really need to change these habits, for ourselves and for our children. When I was a kid, we used to come home from school, do our homework, and then play outside until it was dark. Today, kids come home,watch television, play video games, eat dinner, play video games, maybe do some homework and pass out on the computer. My boss has two teenagers who come to our office after school and watch television and eat for the remaining three hours or so that they have to stay there with their mother. It’s pretty depressing to watch, and these kids have the appearance of thin and healthy kids, but their insides must look like what I imagine the insides of Marlon Brando, circa the 90’s, looked like. It’s fun to go out and play, it’s actually fun to exercise. Healthy food is actually quite delicious, especially when you get used to it. So come on parents, lets not allow our kids to become a bunch of fatties, and I say that with the utmost sense of political correctness. Things from childhood that I never got over, and fully expect my children to have the same stubborness. I knew the Bumbo were death traps!